Bouldering and its Physical Impacts: What Should We Know? Climbing has reached new heights of visibility so to speak with the widespread media coverage of the Dawn Wall ascent earlier this year, an ascent where the strengths and skills developed through high-level bouldering played a major part (to be discussed in another post). In this country at least bouldering as a competition discipline appears to be much more popular than roped climbing and clearly a favorite for youth team training. In other words the future trajectory for bouldering participation appears to be on an upward trend (haha), which is a good thing. Along with this popularity, however, there is going to have be a serious discussion of how gyms, youth coaches and the industry in general will mitigate the physical impact of bouldering going forward. This is a topic that is gaining increasing traction in youth football right now and there is considerable concern that parents will be reluctant to allow their children to play football for fear that irreversible brain damage could be a result of hard hits on the playing field. It has been suggested by Dave MacLeod in his new book Make or Break, that repeated impacts on young climbers could affect vulnerable growth plates, just as with finger overuse injuries, stunting the growth of the lower limbs. 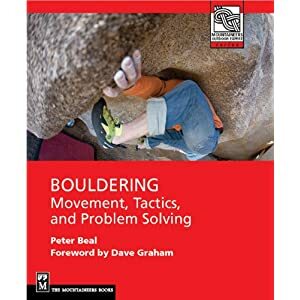 It has long been noted that in bouldering, "Every fall is a ground fall" and the (under-reported) fact is that a fair number of old-school boulderers are paying a significant price for the harder falls of the pre-pad generation. John Sherman, author of the "other" book on bouldering, was taken to the hospital by myself and a friend after popping off a lowball traverse and bouncing his head on a slab at the base. This was one of several concussions he sustained. He has also had two hip transplants. I had a similar experience a couple of years ago in RMNP, ironically bouncing off a pad and winding up with six staples in my scalp. It is a concern of mine that we are not anticipating carefully enough the long-term consequences of bouldering falls, not merely hard impacts as mentioned above but also the less-obvious impacts of repeated "safe" falls, especially in the gym. While I don't think they present the kind of threat posed by the collisions of tackle football, I also am not seeing any clear effort made by the climbing industry to fund scientific research on landing materials, landing configuration, wall construction, route setting and of course fall training as it relates to indoor climbing. This is critical because although outdoor falls present the apparently more dangerous outcomes, most falls occur in the confines of a gym where the convenience and apparent safety of a wall allow multiple repeated falls in a short span of time. As a long-time boulderer myself, I have become increasingly aware of problematic trends in bouldering wall design that have the potential side-effects of promoting long-term chronic injury for their users. The first and foremost of these is height. Despite the glamorization of so-called highball bouldering in climbing media, there are certain basic laws of physics at work that cannot be ignored regarding mass acceleration and the impact forces that result. In a nutshell, the longer the fall the more intense the forces that must be absorbed upon impact. These forces multiply very rapidly so that a fall of two meters has half the impact of a four meter fall, basically a doubling of impact force created by a negligible amount of additional vertical rise in climbing terms. You can check this out thanks to the Splat Calculator, a page posted by a climber. What this implies for a boulderer is that a common gym design, that is a steep lower wall followed by an upper more slabby portion, is tacking on vertical gain in such a way as to make that upper portion much more dangerous in the event of a fall. This danger can be augmented even further by a problem set with a crux move near or at the end, raising the chances for a fall and even worse an out-of-control fall. It's my view that bouldering gyms are now making walls that are much too high. Tall walls look better in photos and create an initial perception of adding value to the visitor's experience but for regular users may have the opposite effect, raising the chances for catastrophic acute injury and inevitably, and unnecessarily adding to the cumulative impacts of repeat falls and deliberate dismounts from the wall (as when a climber is forced to drop from the top). Ironically tall walls inhibit effective training for this reason as the climber pays a real physical cost for repeated impact in exchange for uncertain training benefit, especially with movement that is all too often affected by awareness of the wall height and the potential impact of a fall. I hear from route setters and others that actually these walls aren't that high, remarks that are often tinged with a hint of young male bravado, implying that my concerns are a byproduct of timidity or cowardice. However, I have seen too many young climbers quit the sport for various reasons, especially injury, and have heard from too many older climbers who are intimidated precisely by the potential real-life consequences of an injurious fall to take these responses seriously. Regardless of one's reserves of courage, the laws of physics are strictly enforced in the event of a fall and it seems incumbent on gyms to maximize the well-being of their customers over the ego of the setters and wall designers. Another issue is the landing surface and its configuration. While there are commonalities with gymnastics there are also significant differences as well, especially regarding the height and irregularity of the falls, not to mention the skill level of the athlete and lack of spotting. Basically bouldering gym flooring is in a state of infancy regarding its materials and how it is set up. Gyms want a surface that is safe and durable, two qualities that do not always coincide. So what is to be done? Obviously the first option is the status quo which so far is building high walls and hoping for the best. In my view to do this is missing a great opportunity to seriously study the costs and benefits of different bouldering setups to find the one that best maximizes climbing potential and minimizes risk of injury, whether acute or chronic. The industry is currently on a binge of wall construction which provides a great laboratory for next generation walls and landings to build upon. If you are a frequent boulderer and want to stay healthy, focus your training time on low-impact high difficulty problems that won't cause repeated high-impact falls. If you are motivated to work a particularly high problem, a good tactic to use inside is climbing up on big holds to establish on a high crux in a less tired state, so you learn the move quicker and are less likely to take repeated falls. Avoid gratuitously dangerous high moves such as big sideways dynos as they have a tendency to wreck shoulders and pitch climbers upside down. Outside, if feasible, working a highball on toprope is a really good idea to spare your ankles, knees, hips and back the repeated stress of landing. It goes without saying to pad things as well as possible. Lastly, inside or out, learn how to fall correctly, dissipating impact forces by rolling away from the landing whenever possible. Always analyse in advance the most likely places to fall and anticipate your possible body position in flight and at impact. A competent spotter can be a big help in limiting these forces as well. Good luck and safe bouldering!